At fourteen he became the head of his impoverished family, responsible for feeding eleven on the rough American frontier. By thirty-nine he had established himself as a successful plantation owner worth over $1 million. And at forty years old, Nathan Bedford Forrest enlisted in a Tennessee cavalry regimentand became a controversial Civil War legend. The legacy of General Nathan Bedford Forrest is deeply divisive. Best known for being accused of war crimes at the Battle of Fort Pillow and for his role as first Grand Wizard of the Ku Klux Klanan organization he later denouncedForrest has often been studied as a military figure, but never before studied as a fascinating individual who wrestled with the complex issues of his violent times. 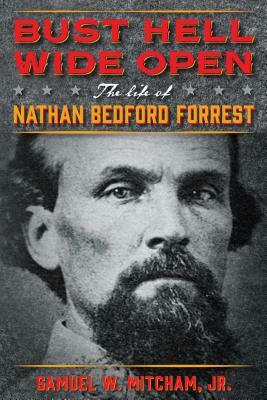 Bust Hell Wide Open is a comprehensive portrait of Nathan Bedford Forrest as a man: his achievements, failings, reflections, and regrets. Samuel W. Mitcham, Jr. was a professor of history at Henderson State University, Georgia Southern University, and the University of Louisiana at Monroe, and a visiting professor at West Point. He is the author of more than twenty books on World War II, including Hitler's Commanders: Officers of the Wehrmacht, the Luftwaffe, the Kriegsmarine, and the Waffen-SS (2012) and Triumphant Fox: Erwin Rommel and the Rise of the Afrika Korps (2009).